If you're experiencing problems with our automatic gate system, our expert technicians can help. You heard it right. We don't just repair and install garage door systems, we handle gates as well. Similar to garage doors, gates oftentimes serve as the first line of defense against would-be intruders, and therefore they should be strong and durable, and their communication systems must function optimally. An intercoms system will allow you to communicate with visitors that are waiting outside your gate without you having to actually be anywhere nearby. Whichever type you have, we can repair it when something goes wrong. Since being able to speak to the person waiting outside your gate before you open it is a great security benefit, making sure your intercom system is fully functional is incredibly important. If you want a new gate installed in your home or business, we're here for you. Whether you'd like a classic-looking wrought iron gate, or a sliding or swing system, you can rest assured that our expert technicians will help you find one that perfectly suits your needs. In also install openers of various brands as well, and can help you find a unit that offers the best safety and security features available in today's market. 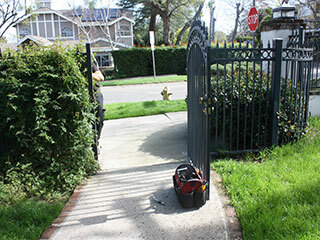 Your gate could still experience damage or some type of malfunction no matter how well it was installed. Since it is constantly exposed to the elements, there are a variety of factors that can influence your system's condition. A motor gear can wear out, an electrical wire can fry, a rail can be hit with a car and become bent, and your opener's limit nuts can even become unadjusted. Regardless of where the problem lies, we'll repair or replace the problematic component in no time. Our experts at Garage Door Repair Moreno Valley have dedicated a great deal of time to perfecting our gate repair skills. We can help you with any related issue with speed and efficiency. Call us today.